In fewer than fifty pages, author Glunaz Fatma successfully gives us the basic history of short fiction stories from Western and Asian Traditions. Being an author of short stories myself, I was very eager to review this book courtesy of Modern History Press. Many famous writers, such as H.G. Wells, Edgar Allan Poe, Alphonse Daudet, Miguel de Cervantes, Shirley Jackson, Charles Dickens, Nathaniel Hawthorne, Rabindranath Tagore, and many others, have written numerous short stories as it gives them more freedom to express their creativeness without being classified by a genre. Just like a novel, a short story must has a well-written plot that leads to a conclusion. A short story is between 1,000 to 20,000 words. Anything over is either a novella or a novel, and anything under is considered as short stories or flash fiction. What were some of the earliest short stories? Author Glunaz Fatma suggests that one of the earliest short stories is Homer's Odyssey, which is a mandatory read in most high schools. Of course there are also fables, myths, and fairy tales that have been around probably even longer. 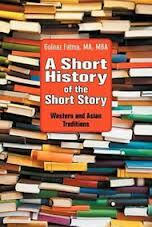 A Short History of the Short Story is written in laymen terms so anybody from any background can read it. Every high school student has to read and do homework from a short story text book and I think this book would make a good companion to it. I recommend the book to students, teachers, schools and all scholars. $120 Gift Card to EdenFantasys!